Occasionally when I find a plant I like and am curious about, I like to research it for more information. Many years ago on a trip to the British Isles, I saw a plant in a garden that attracted my attention because of its bright color and unique bloom shape. I saw a name on a label, and determined to find out more about it when I returned home. I found that most of its cultivars are not really hardy hereon the Front Range, but wanted to try it anyway. 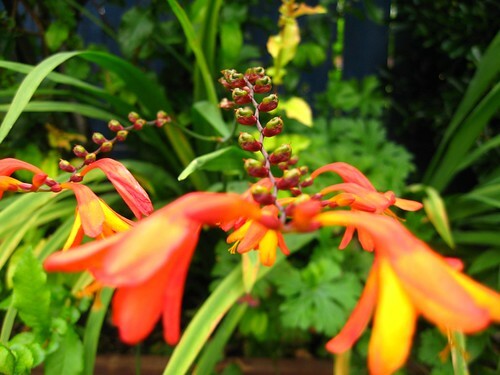 Crocosmia – a perennial in the iris-gladiola family – is a South African native.They grow from underground corms which are unusual in forming vertical chains with the youngest corm on top and the oldest buried the most deeply. The leaves are linear and parallel-veined. The lowest corm is reported to “…have ‘contractile’ roots which try to drag the corm chain deeper into the ground”. I have had mine for 3 years and have not yet dug them up to examine the corm chain structure, but they may have had problems “sinking” in our mostly non-loamy soil. They like enriched sandy loam soil with good drainage and moderate moisture. They grow 2-4 feet tall in a season in our climate. I plan to dig mine up this fall after blooming and replant some of the corms. I am curious to see what they look like. The corms should be easily separable for propagation, and should be fall-planted for next season blooms. Although hardier than glads, they are semi-hardy in our Front Range climate, and should have winter mulch if planted in the open garden. Otherwise, dig and store them like gladiolas. Thanks to Gardener Dave and his love of Crocosmia's has helped me to find out what this plant is I have. Its flowers are spectacular. My friend told me her mother called them "Dirty Shirts" because you always find them in dark corners. 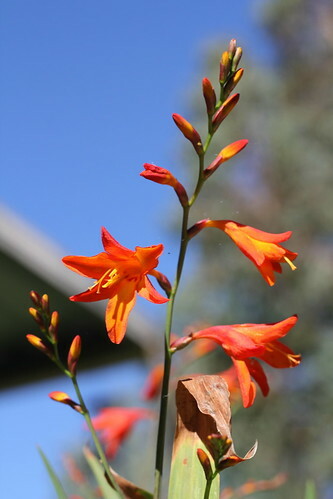 I took some photographs of my potted Crocosmia's and I know you will love them. I make twine from the green foliage as it is very strong and changes to a beautiful brown colour.